Basically, there are three types of spray guns. The conventional, low-volume low-pressure, and high-volume low-pressure spray guns. Of these three, the conventional spray guns are great for specialist coatings such as adhesives and splatter effects. They’ll give you a very high-quality finish and very high working speeds but they do have their limitations. With a conventional spray gun, you’ll get a very high percentage of overspray resulting in 60-70% wasted materials. This is not often the best when it comes to painting or doing remodeling on a budget. Even if you have a bigger budget to work with, it isn’t worth it to waste so much material. Fortunately, there are good options you can consider. Instead of the conventional spray gun, you can choose an hvlp or lvlp spray gun. HVLP (high volume low pressure) spray gun. LVLP (low volume low pressure) spray gun. Both are fantastic spray guns but they have subtle differences. The HVLP spray gun will give you a very high-quality finish. Moreover, it is the most commonly used spray gun on the market, which means that training and support are readily available. Also, you will have a lot of options to choose from, especially if you are looking to buy on a budget. However, you’ll need a very large compressor to be able to use this spray gun. The LVLP spray gun, on the other hand, is a premium spray gun. If you are looking for an all-rounder with superb transfer efficiencies, the LVLP will give you that. 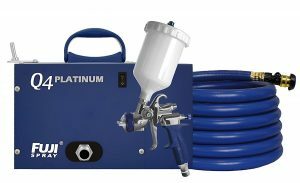 It has a very low waste compare to conventional or HVLP sprayer gun, is able to provide superior finishes and you can use it for waterborne paints. It’s a great tool for most painting jobs unless you want to paint with metallic paints and you need a high-pressure nozzle for it. In that case, you can go for the HVLP sprayer. Why Spray Paint Your Projects? What Is An HVLP Spray Gun? 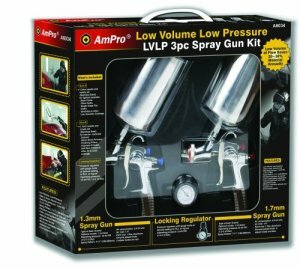 What Is An LVLP Spray Gun? While both HVLP and LVLP guns use 10 PSI or less at the air cap, there are subtle differences between them. Usually, anything less than 10 PSI is considered an LVLP system while anything above that is referred to as HVLP. Most HVLP spray systems use around 20 CFM @ 50 PSIs, which means you need a good HP compressor with 80-gallon tank to use the gun. If you don’t have such compressor (or can’t afford it), this can be a problem. However, most LVLP comes at 10-25 PSI and can work with as little as 5 CFM. And because they use lower air pressure, you can get away with a small compressor. Another distinction between them is that you’ll find in LVLP sprayers a small fan width and lower material flow rates compared to their counterpart. This means they consume less air and you can use them for both on-site and touch up jobs. This is made possible because you can run them from a small compressor. Finally, if you are using this in a production environment, the LVLP sprayer tends to be the best option as they work better because of their fan width and low material flow rates. First, why do you have to spray your finishes? There are a lot of reasons you may want to use a spray gun compared to a roller or brush. If you are painting a chair, it’s bound to have lots of corners, nooks, and crannies. On items like this, it’s much easier to get a uniform application of finish with a spray gun than it is to hand brush or hand wipe a finish unto a project like that. It’s pretty darn easy when you’re using a brush or a rag to leave spots with either not enough finish or too much finish. Sometimes it could be too dry or lots of drips, none of which are good. Handling large, complex projects are a great reason to spray your finishes instead of rolling or using a brush. Unless you are painting a flat surface, it might be difficult to see any problems or blemishes until after it’s dried. If you’ve got a lot of surface area to finish, you might be thinking of which spray painting equipment to use. One of the most commonly used spray equipment for this purpose is the HVLP spray equipment. Those letters stand for high volume low pressure. They can last for many years and can be used to tackle various large jobs around the home (and workshop if you have one). All HVLP systems have three main parts. There is the turbine that generates the flow of air, the hose, and the gun. These systems differ from compressor driven spray equipment and that they deliver a high volume at very low-pressure air. The advantage is that it greatly reduces the amount of overspray material that doesn’t hit the surface you’re trying to coat. And by reducing the overspray, you deliver more finishing material to your project and less goes in the air, which might cause problems. You can use them around your door trim, baseboard corridor, and doors. The portability, simplicity, low overspray, and excellent finishing results make an HVLP an excellent choice for any homework shopper who wants to move beyond brush finishing. The first advantage is that they are the most commonly used sprayer on the market along with a good track record. Also, you’ll find many good options at reasonable prices on the market. HVLP spray guns give you more control compared to other spray guns because of their wider spray patterns. Another plus to these sprayers is the way they deliver warm dry air to the finishing stream, unlike compressor driven sprayers that deliver cold damp air that can sometimes foul up finishes. Finally, lacquer doesn’t get onto the body of the gun with high velocity, thus removing the “orange peel” that might damage the look of your job. In essence, this allows you to sand less and you’ll need little or no recoating, which can save paint costs. One of the disadvantages of HVLP spray guns is that they need a large turbine or air compressor. If you don’t have one, you’ll need to get one along with your spray gun. Moreover, if you have an old one with lower CFM, you may also not be able to use it. They have higher overspray and lower transfer efficiency, compared to LVLP paint sprayers. This system is a little bit different from HVLP spray guns in that it lends itself to better maintenance and low overspray. When you are using an LVLP spray gun, you get lower overspray (better than other types of spray guns) especially if you know how to spray. 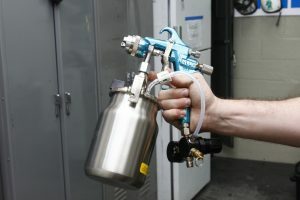 Usually, this kind of spray gun operates at 10 psi at the nozzle cap, which you don’t need to push higher (unlike HVLPs that requires high PSI for better atomization). While HVLPs have 65%-70% transfer efficiency, LVLP spray guns can provide up to 80% transfer efficiency. This means most of the material goes on to the surface, thus minimizing waste, paint costs, and environmental hazard. So, if overspray is an issue for you, then this is the right gun for you. And if you operate it well enough, you’ll find that it’s easy to work with. If you are a woodworker, you can make use of a very small compressor and still get professional results. Generally, these systems have lower CFM needs, unlike conventional spray guns. Imagine using 6CFM @ 40psi compressor or even under and still get a good finish. The advantage is that you won’t have to purchase another compressor (if you have an old one with minimum processing power) while ordering your gun. Finally, if you are a homeowner painting inside your home, you’ll appreciate the lower overspray levels of LVLP spray guns. One of the benefits of an LVLP spray gun is that you get the benefits of using an HVLP sprayer with lower air requirements. This means the percentage of wasted materials is quite low compared to the other types. Moreover, you won’t need a large compressor to achieve a professional finish when using this type of spray gun. With a 110v compressor (or lower in some cases), you can paint an entire surface much more smoothly. This is due to the fact that this spray gun needs a lower volume of air to operate compared to its counterpart. If you are a mobile painting, you know that painting with little overspray is very important. Since compressor size and pausing is not going to be an issue with this gun, you should find it very satisfying when painting. For HVLP spray guns, you get a slight reduction in the speed, which might eat into your time. This, however, may not be a problem if you are typically handling smaller jobs with moderate paint surface. Another thing to consider is that the fan pattern width is smaller (with most maxing out at 10/11″). This may affect the quality of the finishing coat, which isn’t a deal breaker. Knowing this beforehand should help you make a better decision as regards to choosing between HVLP and LVLP spray guns. Another downside is that most people don’t know about them because they are new to the market. However, this doesn’t mean their performance is bad nor their quality. As you can see from the above, if you are working on a budget and can only afford a small compressor (or if you have one), your best option is the LVLP spray gun. Also, if you can maintain them well, you can enjoy an LVLP system. However, if you have the budget to accommodate a high-powered compressor, HVLP spray gun will give you the best experience. They are widely used with parts easily accessible and training abundant. Moreover, many of them are now cheap and can be purchased with one of the average compressors out there. After reading this little guide on lvlp vs hvlp spray guns, you should have a good idea which one to go for. Let’s know in the comment below what you think. P.S. If this post has helped you, please share it with friends on social media!